Our town's big Chocolate Walk is this weekend. I decided to go with a Kiss theme. I thought it would be perfect with Valentine's day and chocolate. Despite having known this was coming for a while now, I'm still running around like a chicken with it's head cut off trying to finish off all my Kiss projects. I hope I'll be able to show them to you soon, but in the meantime, I wanted to share this simple addition to our Valentine Kiss Party. 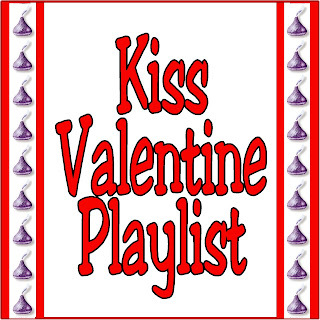 Since we are having a Kissing booth and decorating with kisses, I wanted to have kiss music going on in the background. Not KISS music...I was never a fan of Hard Rock, but music that has songs with "Kiss" in the lyrics. Being too cheap Not wanting to go out and buy all these songs, I made a playlist of YouTube videos with 20 songs with the word "Kiss" in them. I put a mix of several different types of music genres so it would work for just about anyone that comes through our door. Hopefully, this will give your Valentine party a sweet kiss too! You can play it here or find it HERE on YouTube. This Kiss by Faith Hill. When You Kiss Me by Shania Twain. Butterfly Kisses by Bob Carlisle. Kissed You Goodnight by Gloriana.